Duet and solo singing at Degree Ceremony for the President of Ghana in Liverpool. Solo singing was broadcast on Ghana Television. Soloist in concert of works from Creation, Messiah and Elijah. 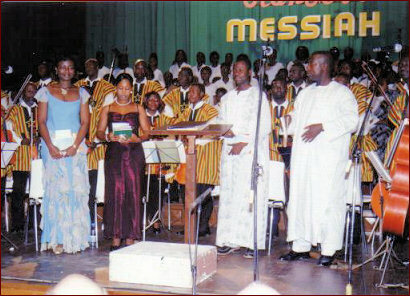 In 2006 soloist in Haydn's Creation in Accra and Kumasi. Soloist with Bitonic at International Conference in Accra to raise money for HelpAge International in commemoration of the U.N. Day for Older Persons. Soloist in Handel's Messiah in various venues in the country. A variety of concerts in various Ambassadors' and High Commissioners' residences. Soloist in concerts in Accra in the National Theatre; the British Council Hall; the Ghana National Conference Hall and the Great Hall, University of Ghana, Legon. Also with The Mighty Five at the College Protestant de Lome, Togo. These include Antonio Vivaldi's Gloria and Handel's Messiah.